We provide with a cozy informative base to enjoy Jaffa & Tel-Aviv without the hassle of a typical hospitality business. Feel at home and when you’re ready, just walk out the door into the vibrant flea market district to ancient Jaffa, the beaches all the way to central Tel Aviv. Postel is a unique urban hospitality project set up by good friends who are also experienced hosts, we're excited to have you over. - Perfect location yet quiet and authentic. - Prepaid online check in. Too easy. - chill-out areas on the roof and yard and green indoor lounge areas. - Bicycle and surfboard rental nearby. 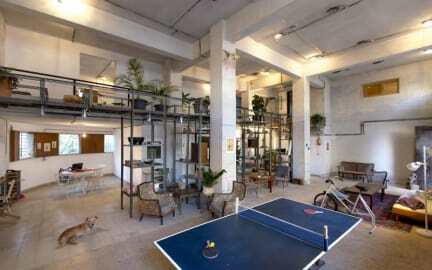 Postel is perfectly located in a quiet street between the main Jerusalem Boulevard to the trendy Jaffa Flea Market. Just around the corner, you will find antique shops by day, turning at night into a merry nightlife district. We are surrounded by delicious typical food and exotic markets. 2 minutes down the road awaits you the ancient biblical city of Jaffa and…. The Mediterranean beach and surf spots. Too easy! You can take bicycles and ride along the beach to Tel Aviv city center or just hop on a bus. This is not yet another “Ikea hostel”, Our rooms are each designed and furnished with vintage furniture true to the nature of the local flea market, the common areas planned by our home designers and are all green with plants. We gave up on reception for online check in, just pick up the key and settle in.This way you are welcomed to check-in yourself at any hour required. Still you will enjoy personal attention and much information. All rooms are private and bathrooms are all shared, so is the communal kitchen to cook together and meet fellow travelers. We encourage you to socialize and meet other travelers and our artsy friends. If you are just looking for a place to sleep for cheap then better leave this room vacant for more fun people to come. Cool place with great atmosphere, well situated in the city, near to the beach and the old town. I would recommend it to all the young and free people who want to socialize and party. For us it was a bit too noisy, though. Cool place with nice atmosphere. Rooftop, garden and basement to hang out. Loud at times because of parties, but thats normal for a hostel. Only real thing bugging us: no warm water in the showers. A beautiful building, very simple but clean and stylish rooms and many lovely details in the common area. Many bathrooms, some of them very nice. The rooftop and garden are not in best condition. The kitchen is well equipped and Jaffa beach just a few minutes walk away. I would stay over there again! When I arrived to the hostel at 3 am one morning, the key pad was off and not working. After waiting outside for 30 minutes, a couple staying at the hostel let me in a different door to which I did not receive a code. As a woman in a foreign country, being locked out of my hostel in the early morning is definitely cause for concern. Also, for 2 out of 3 days I was staying there, there was a film of roughly 25 people filming in the lobby, and they were congregated in the only room with WiFi. Great location and overall place, but unfortunately the pictures are outdated. They put up more rooms now, so the big space with the ping pong table is now much much smaller. There is still plenty room though. The rooftop terrace seemed rather abandoned as if it hadn't been cared for since the summer. The cleanieness can defenetly be improved. As the bathrooms are shared there should be more hooks & shelfs. Having said that we very much enjoyed staying there, our room was very cosy and stylish. Our room (first floor), was way too noisy. The walls were paperthin and you could here everything outside your door/the room next to you/the room above you. We were also bothered by the traffic/passage on the street. We didn’t sleep at all. Anyhow, the place looked cool but wasn’t too clean. I think this place is much more fun in summer when you can hang out outside on the terrace. Postel was in an amazing location. Close to the beach, right in the heart of Jaffa and also a short cycle to the centre. The facilities however were very basic and not particularly clean. The atmosphere felt uncomfortable at times, definitely did not feel any ‘Postel spirit’. The benefits are a great location and affordable, the atmosphere and facilities however, leave a lot to be desired. Got a room which had artificially been added to tbe facilities (old entrance area with subsequently added "walls"). Therefore, it was extremely noisy. Room ans Sheets were dirty as well. Washing machine was broken.